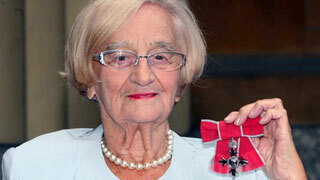 This week we pay tribute to actress Liz Smith, who died this past Christmas Eve at the age of 95. 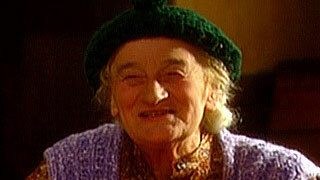 Liz, who was born Betty Gleadle in the northern town of Scunthorpe, was known as Britain’s "favorite fictional grandmother", through her appearances in shows such as The Vicar of Dibley, where she played the Letitia Cropley, whose home-made baked "treats" were anything but, and Zillah in Lark Rise to Candleford. Although Liz always wanted to be an actress, she didn’t get her first professional job until she was 50. Before then she was a struggling single mother to two children, working all sorts of casual jobs, which included being a mail carrier. Money was so tight that Liz and her children reportedly lived in virtual poverty, surviving as she would later confess in an interview with the Daily Mail, “on nourishing soups of lentils and fresh vegetables.” She had divorced her husband of 14 years when she was 38. The couple had met in India while Liz was serving in the Women’s Royal Naval Service during the Second World War and had married in 1945. It seems Liz was no stranger to hardship; her mother had died in childbirth when Liz was just two years old and after her father remarried, at the request of his new wife, he walked out, leaving his seven year old daughter to be brought up by her widowed grandmother. Liz credited director Mike Leigh for transforming her life, when in 1971 as she was selling toys one Christmas in Hamleys department store in London, she received word that the fledgling director was looking for a middle-aged woman who could improvise. She auditioned and was cast in Leigh’s very first film; Bleak Moments. Made on a shoestring budget with the cast and crew all earning just £20 (about $30) a week, the film was well received, with Roger Ebert in the Chicago Sun-Times calling it "a masterpiece, plain and simple". It was a career breakthrough for Liz and the 1970s and 80s found her appearing in numerous popular television comedies and dramas, including Last of the Summer Wine where she appeared as one of Compo's girlfriends. 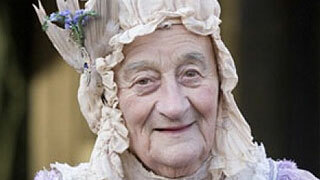 Liz also appeared on the big screen, most notably as Grandma Georgina in Charlie and the Chocolate Factory in 2005. In early 2009 Liz suffered a series of strokes and thought she’d never work again. She couldn’t walk and she couldn’t talk. In July of the same year, from the confines of her wheelchair, she attended a special ceremony at Buckingham Palace presided over by Prince Charles to accept her Member of the Order of the British Empire award for services to drama. She also announced her retirement from acting. Liz would eventually recover enough to come out of retirement and appeared in two episodes of crime drama The Tunnel.